I always think finding a great sushi place is hard to do. Once again, this place is pretty good in some aspects, but definitely misses on others. The rolls can be hit or miss for sure. The location is sort of strange... it is in the garden floor or basement of a building in lincoln park. It is very dark and crowded. I will say though, they are home to a creative roll that I really enjoy. But it still isn't enough to bring it above average. A 2.5 mile rating fits well. A great way to start off a meal... Fresh chilled oyster with a raw quail egg, lemon, soy sauce, and some hot sauce! 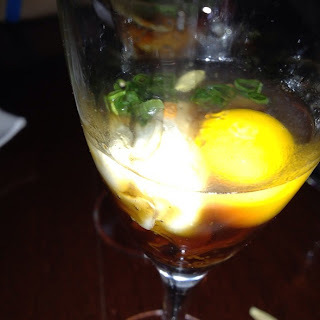 It is served in a champagne glass and meant to be eaten all in one bite. You can really taste the oyster and the different sauces. 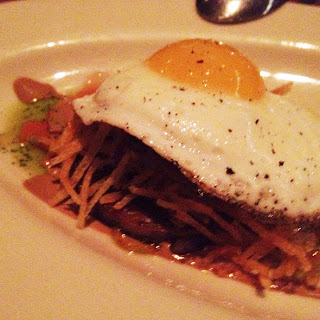 The quail egg gives it an added richness. I suggest ordering one or two per person! This roll is one of my favorites everywhere. I know its not typical sushi, but tempura frying a roll always hits the spot. This rolls is filled with shrimp, crab, cucumber, masago, and cream cheese... it is then tempura battered and deep fried and topped with a spicy mayo. Eat it quickly while the cream cheese is still melted and wow the flavors are intense. Unfortunately, I think the creaminess overpowers everything so that the rest of the ingredients are essentially useless. They also add way too much spicy mayo. There is no point in adding all the other ingredients with all that mayo. Lighten up on something. Without question one of my favorite rolls! It is filled with shrimp tempura, unagi, sweet crab, masago, and mayo and the best part about it is that instead of being held together by seaweed, it is wrapped entirely in thin slices of AVOCADO! 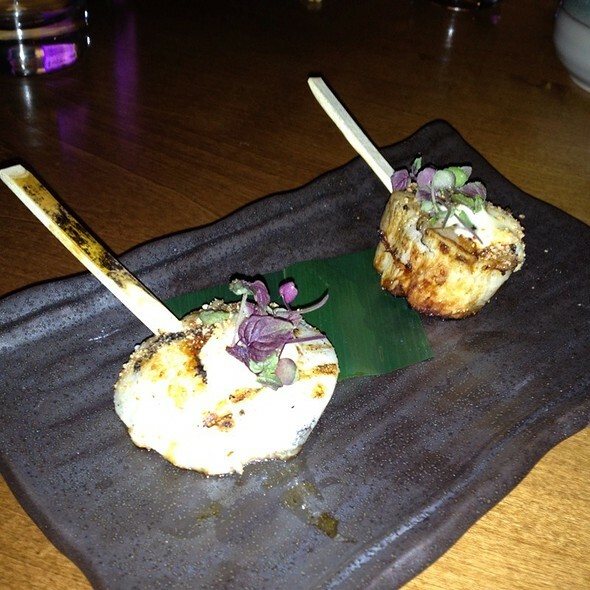 For a little texture change, it is topped with tempura crunch and masago and for sweetness, a little unagi sauce is added. The creaminess is out of this world... I have never found a roll similar to this one and I can understand why it is considered one of Kyoto's specialties and most popular rolls. 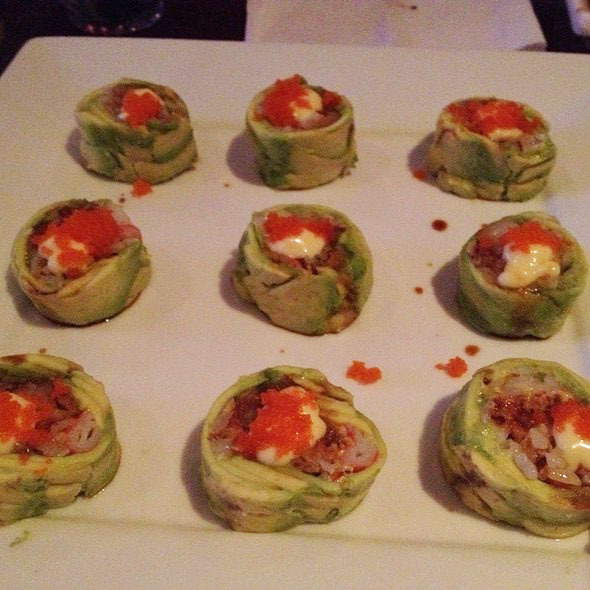 A MUST TRY ROLL!!! Orange Sunset Roll - Shrimp tempura, sweet crab, avocado, ginger mayo, and topped with salmon, orange slices and tobiko. 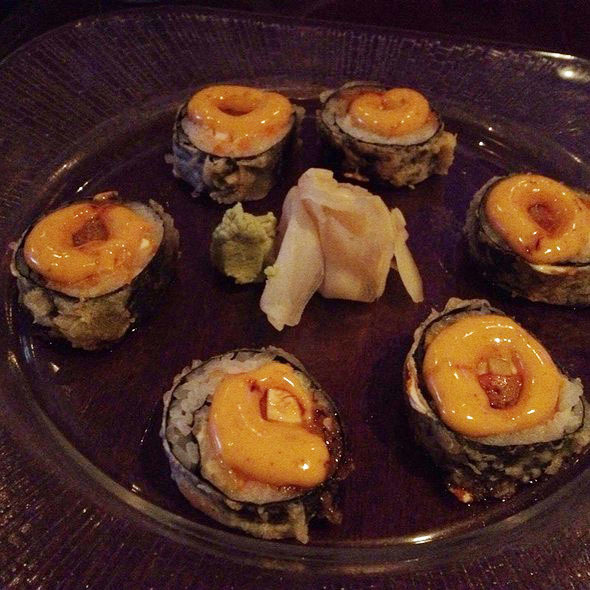 Fireball Roll - Unagi, avocado, spicy tuna, jalapeño, and truffle oil topped with tempura crunch, chili oil, unagi sauce, and wasabi tobiko. Overall these two rolls were just subpar. I was a disappointed because there were actually too many ingredients and too many flavors going on. It looks amazing from reading the list, but it suffers from being too complex. 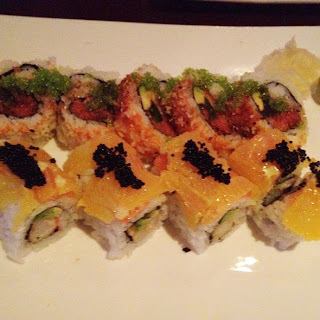 The Orange Sunset Roll was more refreshing because of the orange slices, but the shrimp tempura and crab are all lost under the stronger ginger and salmon tastes. I haven't seen too many restaurants with this combination, and I now understand why. The Fireball Roll suffered from being topped with truffle oil. That oil is very strongly flavored and this overpowers even the sweet unagi and the spicy chili oil. I do wish the rolls were simpler, but that could be our fault for choosing them. - Share rolls! This way you can try a lot of different rolls and get a sense of which is better! Also, the rolls are much bigger than some places so sharing is better! - Ask for extra ginger... It can be used for palate cleansing before switching rolls! - Do look at Groupon for a deal... I have been here multiple times with groupons which definitely helps out the wallet! - Don't drive here... parking is insane to find. - Don't choose rolls that have 10000 items inside... I did, and it was a mistake. Definitely try the more simpler ones if you enjoy sushi, but if its first time then go ahead and try the complex ones with tons of flavors. Lately, this place has been extremely popular for both their burgers and their milkshakes. 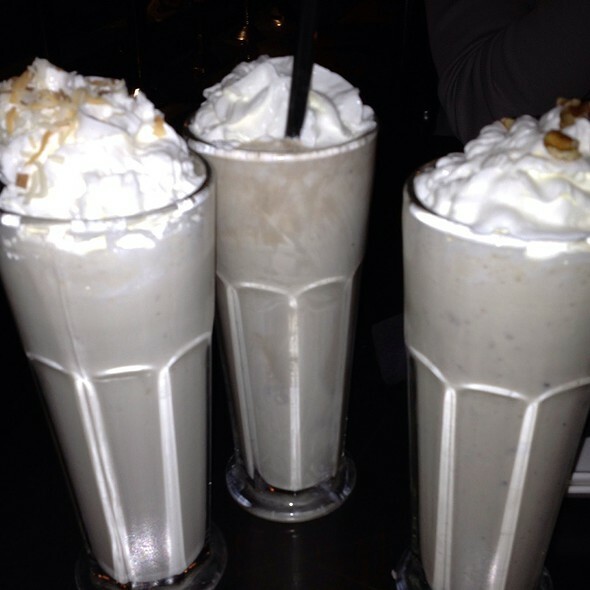 But these aren't ordinary burgers or milkshakes... these are ENORMOUS customizable burgers and ALCOHOLIC milkshakes! 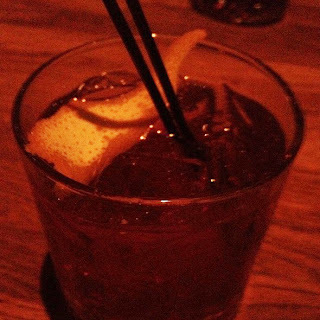 It is a fun place to come out with a group of friends or on a date. The 3.5 mile rating may be a little low partially because my burger was overcooked and the waitresses were extremely slow. Also the prices are a little steep for a burger joint (see description of burger for pricing). I do hope to go back and eventually increase the rating! The milk shakes were delicious. Extremely thick and surprisingly had a nice kick to it. I don't think it is possible to get tipsy off these milkshakes so I would recommend ordering some cocktail for side drinking and almost using the milkshake for just a dessert! They are large in size and I wished they offered a cheaper, smaller version. After a while, the milk shake is just gets to be too much ice cream. So the great part about this restaurant is the customizable burgers. First of all the beef is great quality and they don't skimp on size... these burgers are HUGE. 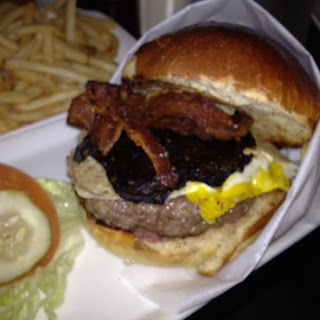 It is ground sirloin and I had mine piled high with Jalapeño Bacon, a fried egg, and a grilled portobello mushroom! Each topping costs $1 and each of the sauces also cost $1. I was disappointed because cheeses cost $2 which is a little steep considering the base price to be $9 without any sides. So be careful because the price of your burger could easily top $15 without sides. Anyway, back to the burger... mine personally was overcooked... I enjoy medium rare burgers and mine was more of medium. 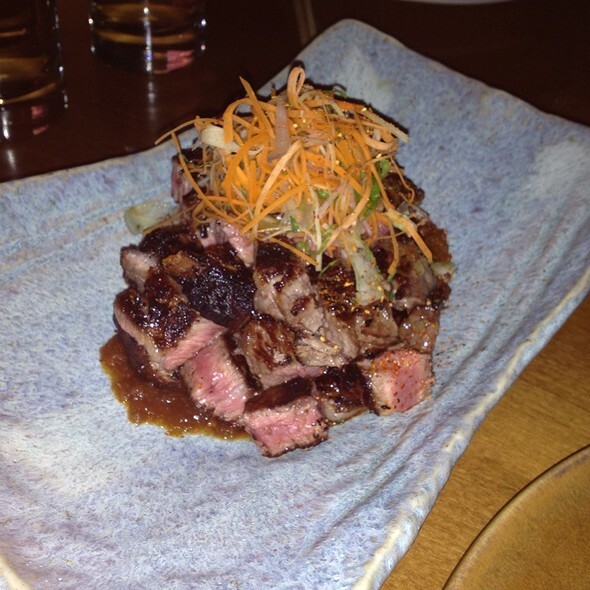 It was still juicy and tender mainly because of the quality of the meat so I couldn't complain too much. The bun was a thick pretzel bun which was much needed to hold all the toppings and soak up all that juice running out of the burger. Overall, it was delicious but could be better. Choose the right toppings and this may become one of your favorite burgers in Chicago! The large order a fries... it was way too much! Suggestion is to order the small order! They were extremely crispy and had just the right amount of salt. I definitely suggest getting these over the regular fries or possibly ordering the half & half option. 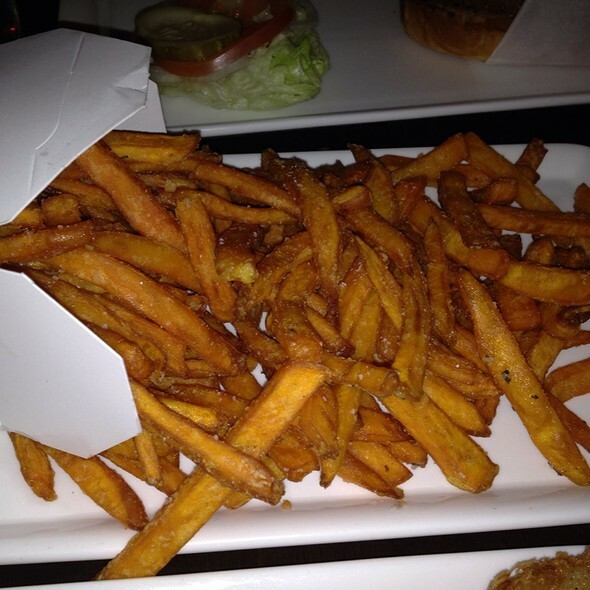 There is just so much grease from all the food and these sweet potato fries help break up that grease with the sweetness from the potato. Definitely not a healthy option but maybe choosing the better of two evils? Without question the best side dish of the night. These were lightly battered and quickly fried and served piping hot! 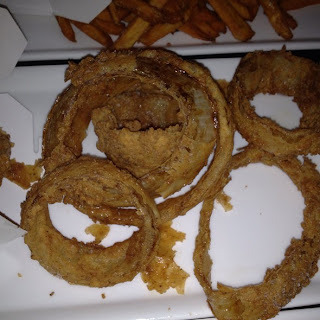 The onion was a nice thick slice, not like other places with extremely thin onions. They were salted perfectly and had a subtle sweetness to it. Perfect! I put a couple inside my burger and that was to die for! - Do check for deals online. We found an amazing deal on YouSwoop which basically cut costs in half! But remember to TIP ON THE PRE-DISCOUNTED BILL! - Do order the alcoholic milkshakes! Definitely worth trying! - Do share the sides... the fries/onion rings are huge servings and with the burger can easily be shared! - Don't drive here... it is in the heart of downtown Chicago and parking is either difficult to find or will cost you an arm and a leg. - Don't try to get tipsy/drunk on milkshakes... I would order cocktails or some other drink and then use the milkshake as a dessert. If anyone is looking for a great "dive" and an amazing meal, this is definitely the place to come. It is a bit far from the city, but this diner is where the locals come for delicious blue plate specials and the pot roast sandwich... considered one of the "best sandwiches" in Chicago. I gave it the 5 mile walk because of the great atmosphere, friendly staff, delicious food, and also because I would literally have to walk the 4 miles to come to this must try "dive." 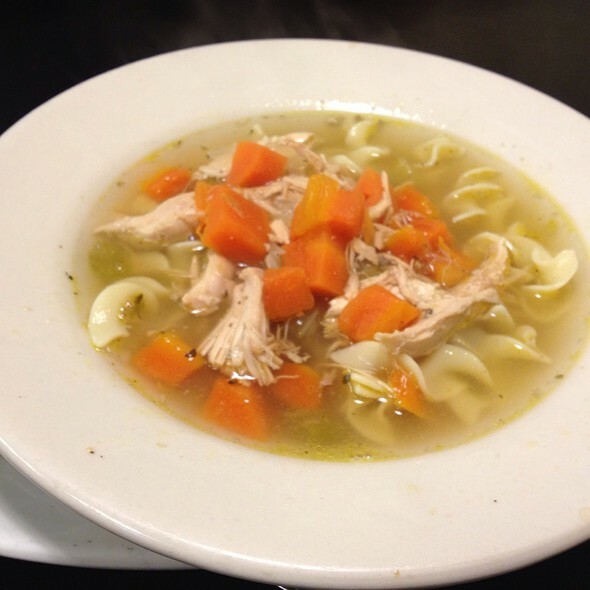 Just like mom's chicken noodle soup. Pulled chicken, egg noodles, carrots, and in a piping hot broth. This is part of the blue plate special. But if you choose to order off the menu I would still recommend the soup. It would be amazing on a gloomy day! 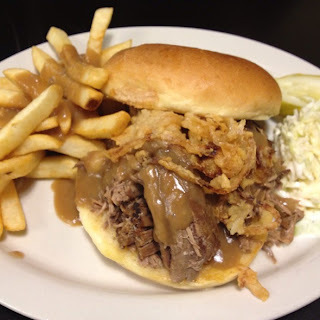 Extremely tender beef pot roast piled high on a hamburger bun and topped with deep fried onion strings. It was smothered in homemade gravy and served with fries covered in gravy and coleslaw. Easily the best part of dinner and something everyone should try. No wonder it was voted as one of Chicago's top 30 sandwiches! I have heard good reviews about their other sandwiches too, so I can't wait to come back to try the turkey open face sandwich! Today's blue plate special! Its such a great deal. The beef was pounded tender and lightly fried and served with that amazing gravy. The mashed potatoes were chunky and buttery and the carrots had a nice sweetness to it. 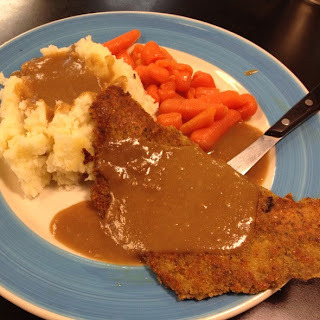 The carrots were more mushy rather than having the nice textural component of crisp, but the fried steak took care of the texture contrast. This plate was amazing!! Can't wait to come back and try the other specials! This dessert will turn a frown upside down! 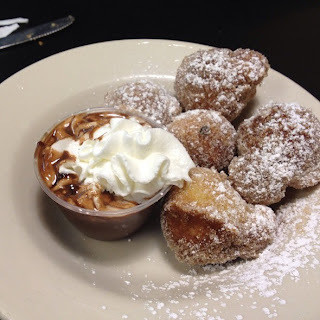 It is a cross between a doughnut and a beignet is made-to-order and is served with a cup of melted chocolate and whipped cream. You could definitely tell they went the deep frier to the table! Crunchy on the outside and soft in the middle! Be careful though... they are served piping hot and will burn the tongue! - Just come on in and grab a seat... no need to wait for a waitress or waiter. Menus are on the table! - You have to drive to this restaurant, but no worries, free parking on the side of the restaurant and lots of metered parking! - Don't come during a popular eating time... We came around 5pm, I believe, and it wasn't packed. But once 6pm hit... there was a wait since the place is small. A new hot spot in Chicago that focuses on a type of Japanese cooking style that focuses on grilling. The atmosphere here is amazing--very upbeat and is definitely a place to be seen. The food keeps up with the reputation of this restaurant. Most of the dishes will immediately make you crave coming back and the others are hit or miss. Definitely a great place to bring a date or just to try if you like the mainstream restaurant scene! Personally, this was my favorite dish of the night! Served like lollipops, this appetizer unfortunately only comes with two scallops and makes you WANT MORE AND MORE! 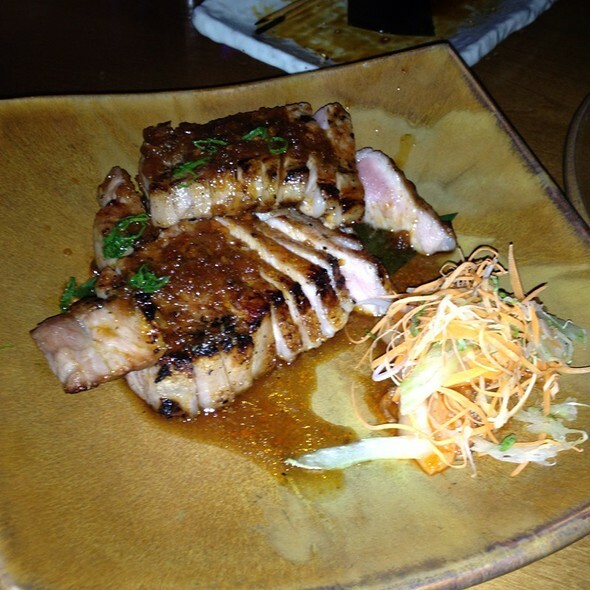 It has a yuzu sauce which is a kind of citrus based sauce, similar to grapefruit. It is served with micro greens and is meant to all be eaten in one bite. A must try dish! 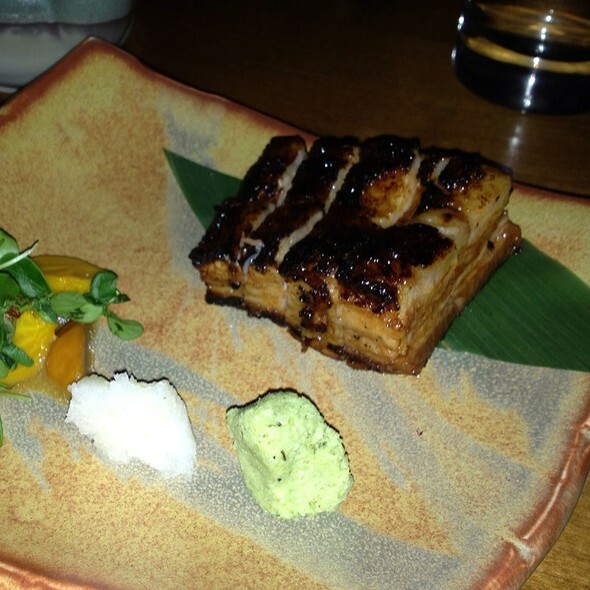 An extremely tender pork belly with the perfect amount of fat and crispy skin. 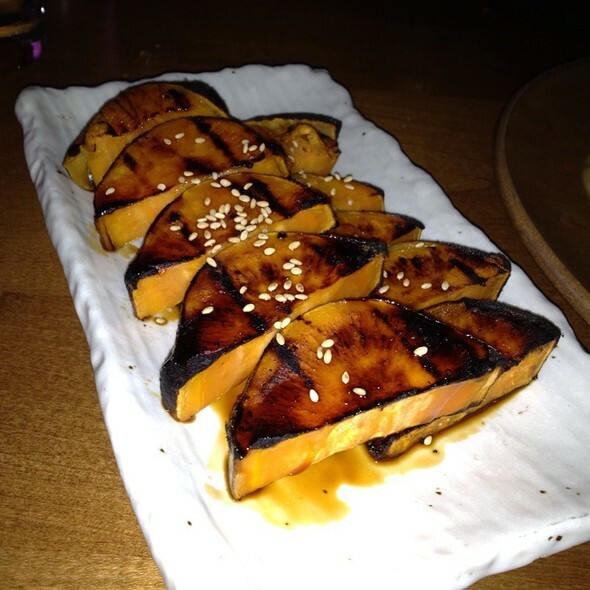 It is served with roasted golden beets. The fat was packed with flavor... so much that I can actually consider this one of my favorite pork belly dishes I have tried! 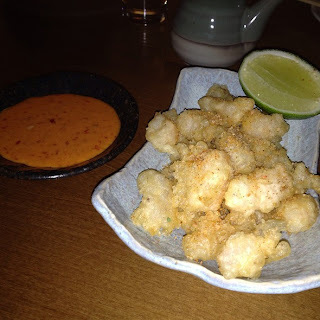 The rock shrimp tempura had large chunks of shrimp lightly battered in tempura batter and fried. It was crispy and was served with a sweet chili aioli sauce (without question the best sauce of the night--in fact, we saved the sauce to dip other pieces of entrees). I was disappointed because it didn't come with the wasabi peas which I am a huge fan of. Hopefully they don't forget the next time. The presentation for this dish is incredible... it was difficult to get a good picture because it was wrapped almost like a present. 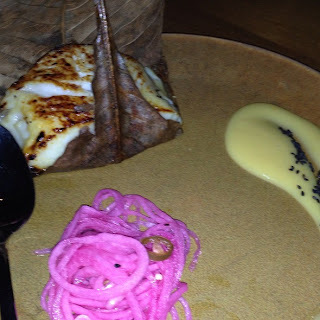 The cod was buttery and flaky and it was served with amazing pickled red onions. Make sure to combine it all to make the perfect bite! This was cooked to a medium temperature and I didn't like it as much. It was a little tougher and served with the sauce drizzled on top. 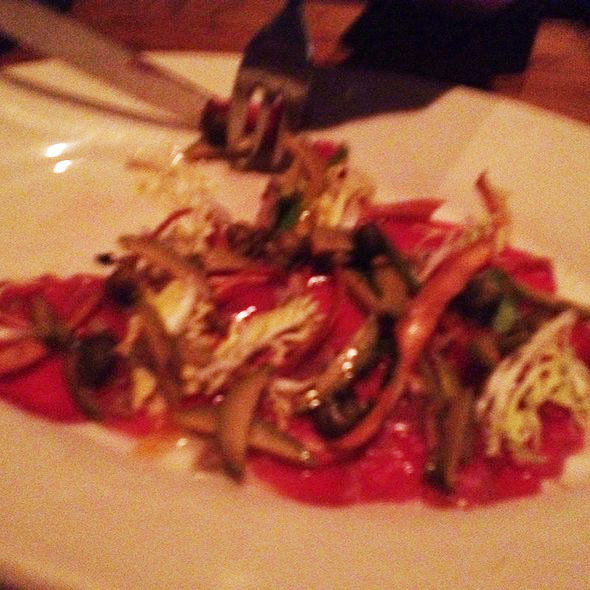 It was piled high with a micro green salad as well. 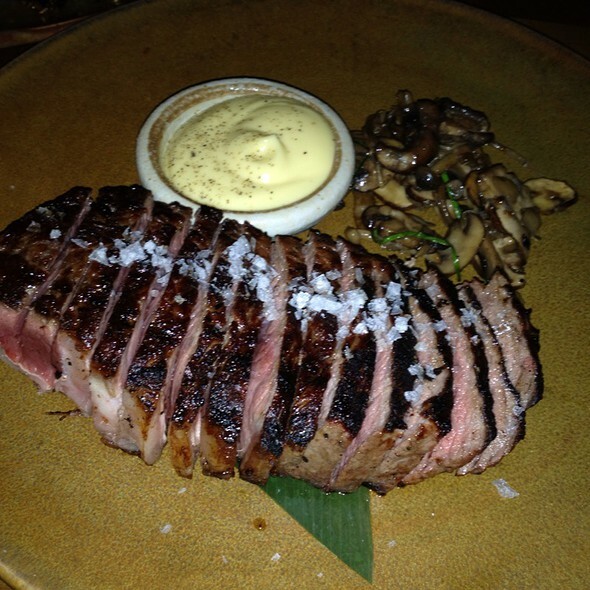 A great cut of meat... this was cooked medium rare to medium. So a little overdone for my preference but it was extremely tender. It had a nice salt crust on top and was served with a black truffle aioli sauce which is another sauce to save for other dishes. I really enjoyed this steak! Served with kimchee, this dish was good but definitely not great. It had way too much cumin so it overwhelmed any other flavor. The pork though was cooked to a perfect temperature. I felt this dish had a Korean influence... It reminded me of Korean BBQ. The meat was delicious--tender and well-spiced. But, the sauce was a disappointment. It is very bland and just added heat to the dish. First time trying this type of mushroom. It was cooked with a soy butter and garlic sauce. I was surprised when biting into the mushroom because of all the sauce that was absorbed when cooking. A great side to share! I am a sucker for brussel sprouts and these were something special. It was served with a Wafu dressing which is a soy sauce based vinaigrette used a lot in Japanese cooking. I really enjoyed the Bonito flakes that were sprinkled on top! Definitely not my favorite dish... some of the sweet potato was cooked perfectly and some were undercooked and some overcooked. It was hit or miss. - Do share plates... This restaurant is meant to share even though people do order their own dishes. They serve it family style so not everyone's food will arrive at one time if each person does order their won food. - Do try more of the appetizers. I felt these were the best dishes and best deal too. - Do make reservations. This place is packed all the time! But it is definitely a great place for a date. Without question, this place has one of the best, if not the best, deals in Chicago. On Friday's, they offer $1 Falafel sandwiches... yes one dollar! I was skeptical at first, but as you will see from pictures below, the sandwich is packed with fresh veggies, sauces, and falafel and is a great size! Unfortunately, the other item I tried wasn't the best which brought down the rating. Also, the overall flavor was on the disappointing size, but it still filled me up, so I can't complain too much. From 11am to 2pm, Babylon has this amazing and unheard of special. I wasn't sure if this was some kind of trick... but it wasn't. You don't need to buy anything else. I would order two sandwiches and tell them to be light on the sauce or maybe get it on the side. 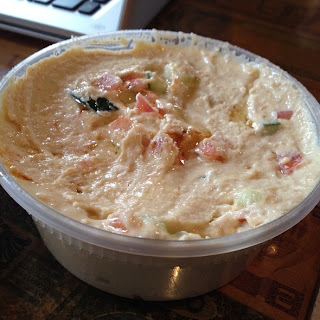 They tend to drown everything with the tahini sauce which isn't very appetizing. 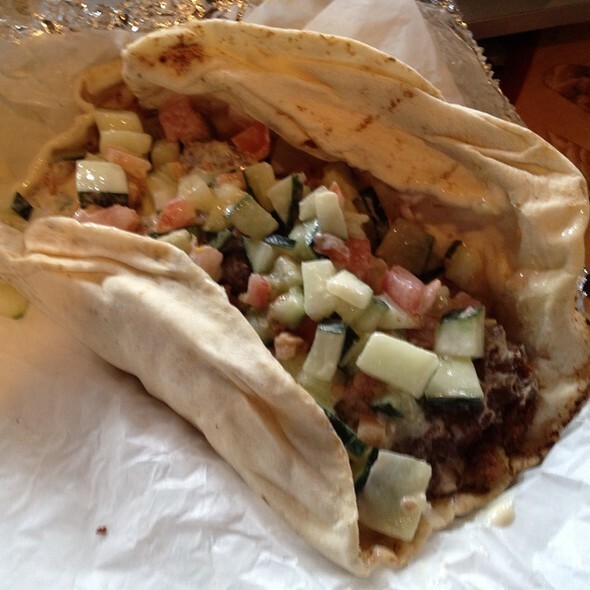 The pita bread wasn't the softest and was more like a pita wrap than the typical pita pocket we are used to. But once again, it is difficult to complain when a large meal only costs $1. The hummus had tomatoes and cucumbers mixed in to it. I do wish the hummus was creamier and tangier... it didn't have much of a bite or anything. Also, it was a bit on the chunky side. There was no salt or pepper added or any oil. It kind of reminded me of mashed chick pea or "hummus making in progress". The pita was once again on the tough side. And for me, I didn't really enjoy it. I would just stick to the dollar falafels. - Do come for the Friday special. But just remember it was only $1. - On Fridays, don't order anything else... stick with the falafel. On other days, try some of the other menu items and definitely let me know how they are. A great little deli in the heart of downtown! They have delicious lox and amazing pastries. Unfortunately, they do miss on a few of their dishes like their soup which is disappointing. I haven't had the different sandwiches yet, but this deli looks promising. I will definitely be back. The soup was ok... the Matzo ball had an interesting consistency and the broth was fairly simple. In fact it almost tasted like plain chicken broth. I wish there were some vegetables or more seasoning. 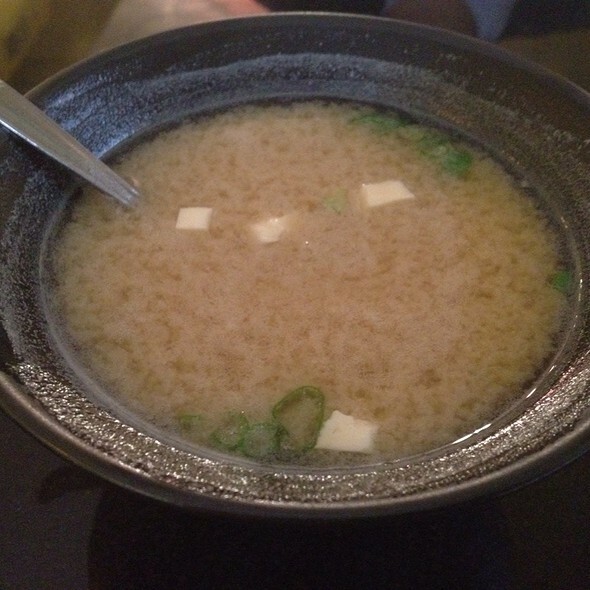 This soup is amazing during the winter because it is served piping hot! 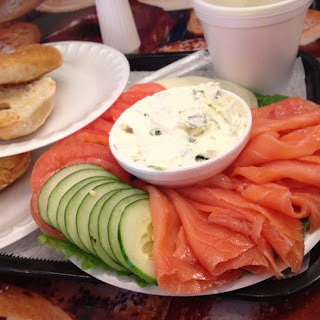 Best lox I have ever had. Not fishy at all, very tender... Amazing! Came with fresh tomatoes, sliced cucumbers, onions, homemade chive cream cheese, and of course toasted bagels! We chose one of the everything bagels and also a plain one. The everything bagel is much better with all the different seeds and grains on top... It gave the bagel nice texture. The platter comes with so much food and we had tons of leftovers. The price was pretty high so maybe a smaller option would be better! - If possible, walk here or take public transportation. There is minimal parking and it gets frustrating after a while. - Do share the lox platter. It is delicious but way too big. And order extra bagels! - Do order some of the desserts. I forgot to take pictures of the rugelach but they have three or four different flavors and each are amazing. 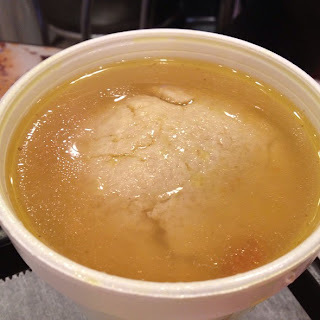 - I wouldn't order the matzo ball soup... it wasn't very special in my opinion but thats just for me. A random Asian style restaurant in the middle of Little Italy. I was hoping it would be promising but the sushi was sub par and just not fresh. 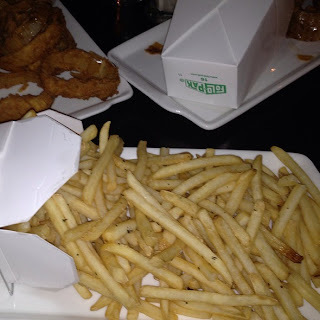 It didn't get half a star because I was able to try the sesame chicken and it was ok... I probably wouldn't be back but give it a try and see for yourself. The soup was definitely warm... but it tasted as if it was cooked the previous day and reheated... It was extremely salty... actually too salty for me to finish. It tasted ok if you could get past the saltiness. 3 sushi rolls for $9 with a small salad and bowl of miso soup. 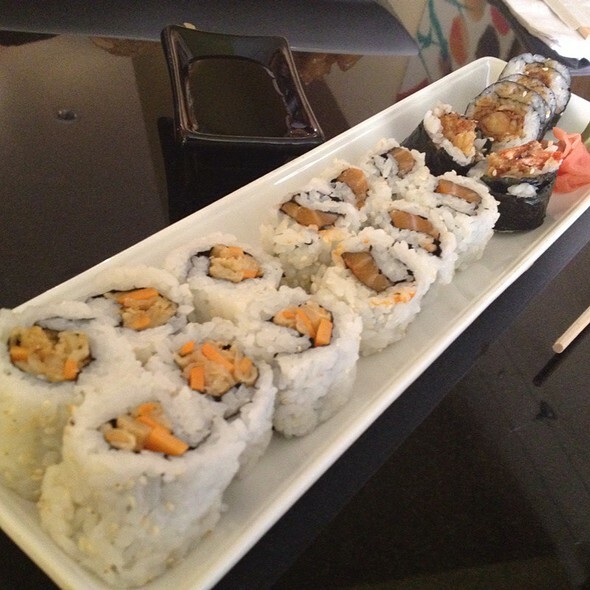 I chose the tempura sweet potato roll, the spicy salmon roll, and the shrimp tempura roll. The rolls weren't the freshest... especially the tempura rolls... It appeared to be old tempura fried items that were kept in a refrigerator and then made into sushi. They weren't crispy and I just didn't enjoy them. The spicy salmon was not spicy and the wasabi was disappointing. Good deal though for $9... but I wouldn't be back. - Maybe come for lunch and get their specials... they are fairly cheap. The rice items (chinese entrees) are much better than the sushi. - Don't try the sushi... It doesn't satisfy cravings and will just disappoint. A restaurant that goes above and beyond its hype! This is definitely an amazing place to try more exotic approaches at cooking and a great way to be adventurous without stepping too far outside normal comfort zones. The small plates here are perfectly sized and the menu is extensive enough and changes frequently enough that the restaurant will be calling your name to come back and try more. I am so glad this gem is found in the great food city of Chicago! Sometimes I wonder why places charge for bread and butter... and then I try this bread. I honestly wished we ordered more of their breads! 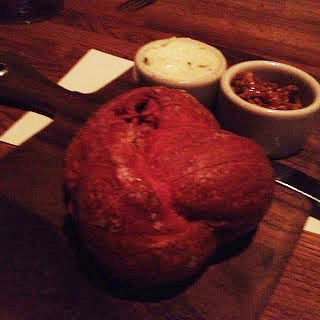 This beet bread was freshly baked with pork fat... It comes out steaming hot and with a side of sweetened assorted nuts and a creamy goat butter (I believe). Slicing the bread can be a little tricky, but once you get a slice, top it with a generous helping of the butter and sprinkle just a few nuts (you don't want to overpower the pork fat flavor). I kept wanting more of their bread throughout the night. I believe this dish is a great one for non-adventurous eaters. It sounds crazy... I mean it says duck tongue in its name. Anyway, this dish reminds me of the typical stir fry you get in a chinese restaurant. Stir-fried with some roasted mushrooms and assorted greens and topped with crispy wontons. I craved a rice or some sort of starchy vessel to eat with the dish. 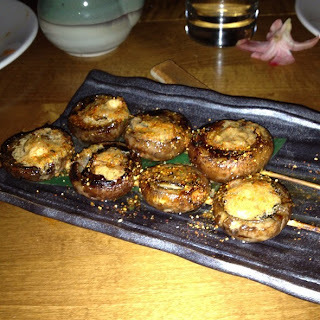 The tongues were extremely crispy, so that fried flavor definitely came through. Delicious! 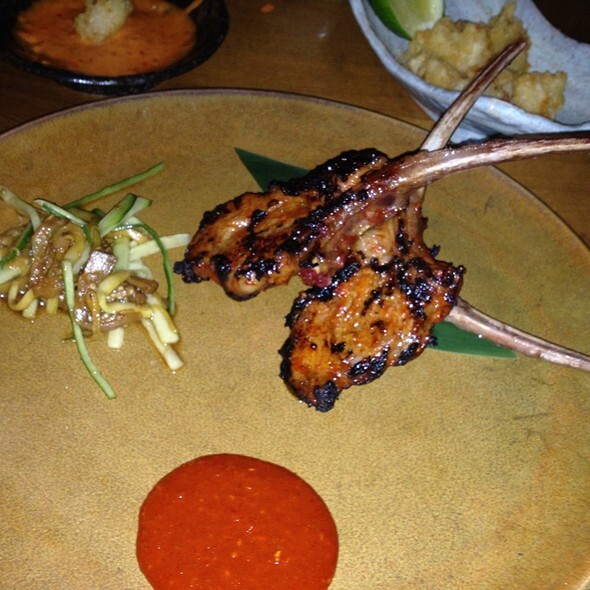 Sliced extremely thin, this is the raw goat option we decided to try. 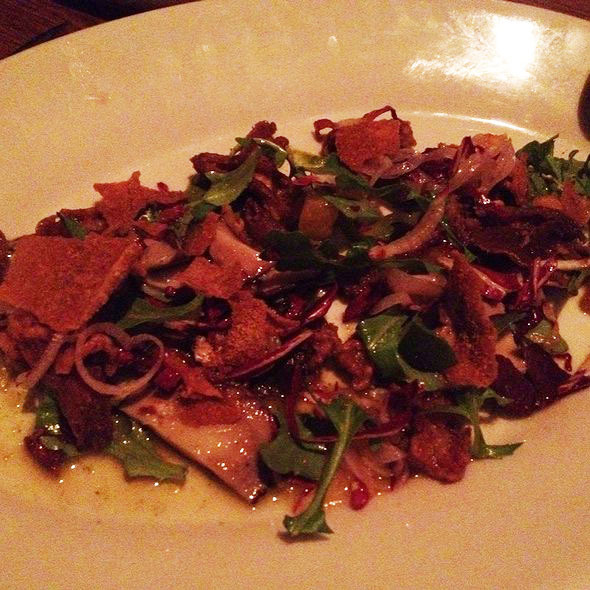 It was served with a micro green salad mixed on top along with a few capers and smoked roe. I love capers so I may be biased but rolling some of the salad, capers, and roe into a roll with the goat meat made a memorable bite. Sorry for the blurry picture. The flatbread here was a nice way to explore the goat meat option without being to "exotic." The vessel was a crispy wheat crust. 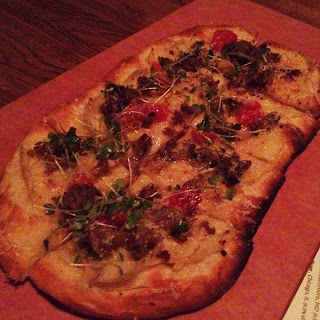 It was topped with goat chorizo, apples, ricotta, and green tomatoes. It is a perfect plate for four people! I do wish they used maybe a goat cheese instead of the ricotta, but I do see how that stronger cheese may overpower the other ingredients. I just have a taste for goat cheese and unfortunately didn't try anything with it. This was my first time trying escargot in a non-French way (usually I have it in butter and with toasted baguette slices). I was excited about this dish and it turned out amazing. In fact, it was one of my favorites. The ravioli are huge and each stuffed with a full escargot. It was very simple... cooked with a little bacon and had a miso type sauce to it. I could eat a bowl of these and still would crave for more. Without a doubt some of the largest mussels I have ever seen/eaten. 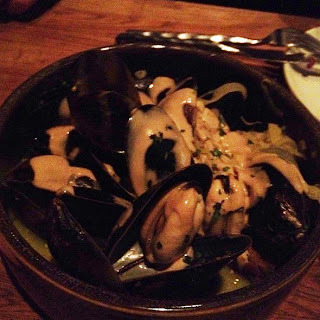 They literally took up the entire shell and changed my view of mussels forever. 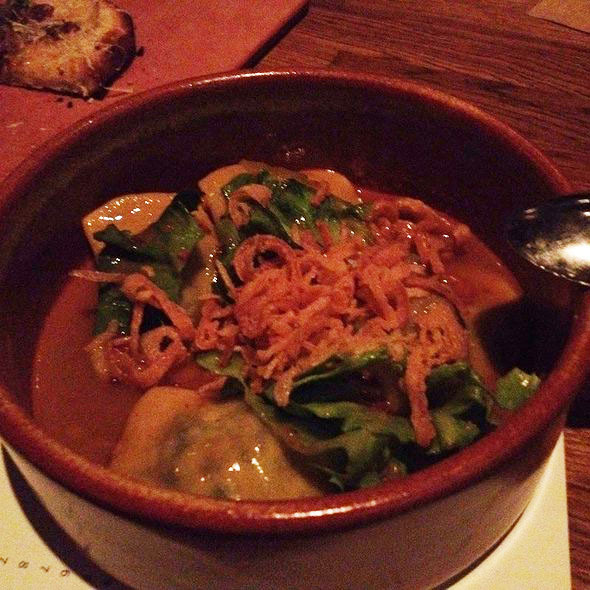 They were cooked in an amazing white wine broth and served with crispy goat sausage croutons! You have to let those croutons soak in the the broth before eating them... It does remove the crunchiness but loads the croutons with even more amazing flavors. I just wished I had more bread to dip into this delicious broth! Another one of my top dishes from this restaurant and another one of their goat specials of the day. 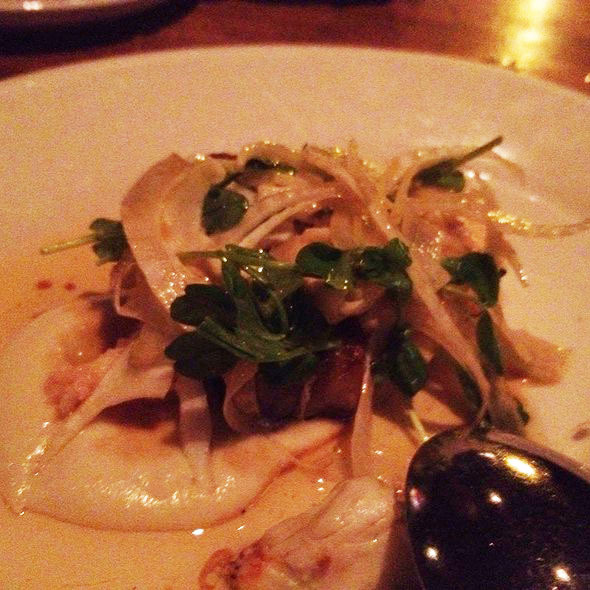 This goat belly is cooked in a bourbon butter with lobster and fennel. Huge chunks of both the belly and lobster were everywhere. I really enjoyed mixing everything together and making that one great bite! Definitely a must have! Coming from a Filipino background, I have had a similar dish to this known as Sisig. The modern spin wasn't as good as the traditional version I had in Cebu, Philippines, but it was a great way to introduce the dish to Chicago! The Pig Face is mostly the cheek of the pig and some of the skin. It is oven roasted and then mixed with some chopped onion and potatoes. It is all topped with a sunny side up egg. When you get this dish, make sure to MIX EVERYTHING! It is supposed to be served with rice... and I believe it would be 10x better if it came with a side of rice. But overall it is a good dish and a funny item that shows up on your receipt! Our waitress recommended these as the vegetable we should try. Once again I saw a spin on a Filipino dish that I have grown up eating. 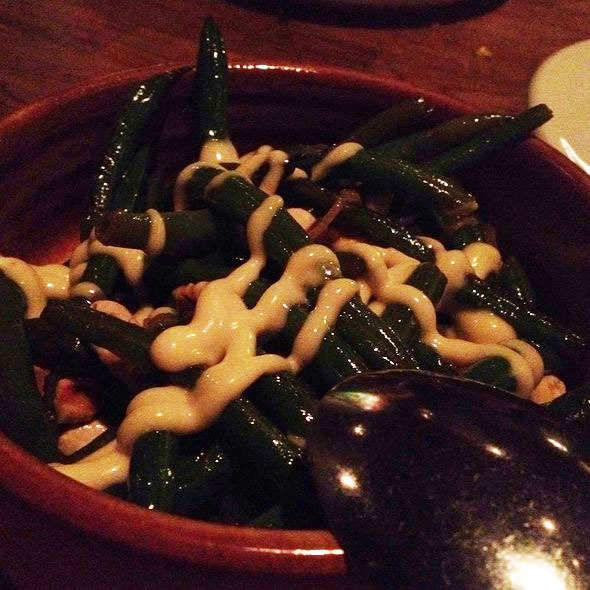 After sautéing the green beans, they top it with a creamy version of a fish sauce and some chopped cashews. There were great texture contrasts in this dish, but the fish sauce may be a little too strong for some people. 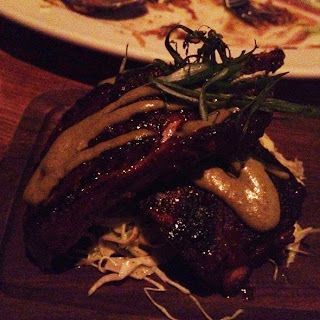 Fall of the bone ribs... usually I have very picky because some places have tough ribs... But we figured at such a popular restaurant it must be delicious... and it was! It had a nice spicy rub on the meat and then was topped with some kind of sauce that was hard to explain. I probably wouldn't order it the next time but only because there are so many other menu items to choose from. Once again I apologize for such terrible pictures. Anyway, this dessert was recommended by the waitress. It is extremely rich... especially with both peanut butter and chocolate. So if you are looking for that rich dessert.. try this one for sure. The chili actually is more prominent than expected. A slight burn is felt after a couple bites and it makes you wish for some kind of ice cream to be served with this dish. Great dessert! How could we pass up on a dessert with cheddar cheese and butternut squash? We didn't... mainly because it sounds like typical entree ingredients. 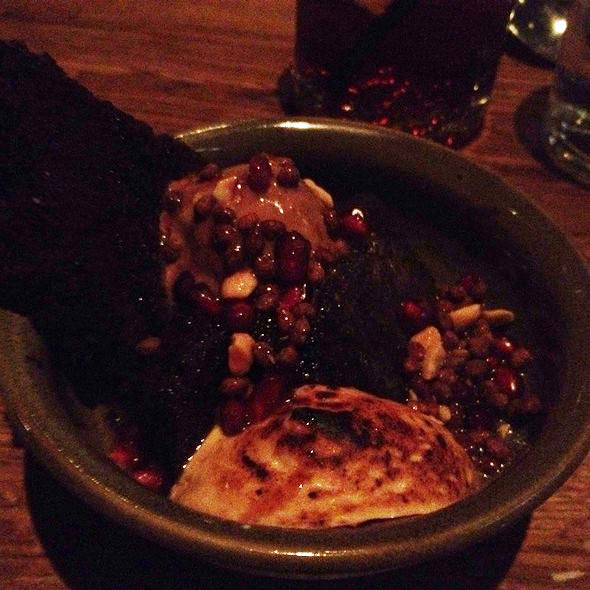 I really enjoyed this dessert because of the salty and sweet contrasts. 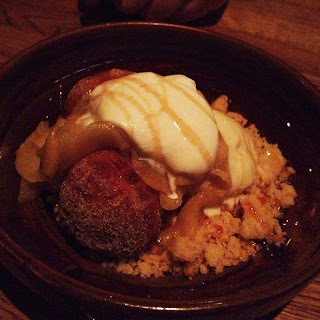 The squash donuts were surprisingly sweet and freshly fried. The cheddar cheese was nice and sharp and the ice cream just made the entire dish creamy. Definitely a great way to cap off an amazing and memorable meal! I am not much of a liquor/cocktail drinker, but had to try this little creation. Unfortunately I forgot the ingredients but I do remember it calls for liquid smoke. Try it! - Do order the different styles of bread. It may seem weird to order bread for the table, but missing out on their amazing homemade breads would be disappointing. - Do come with a larger crowd. 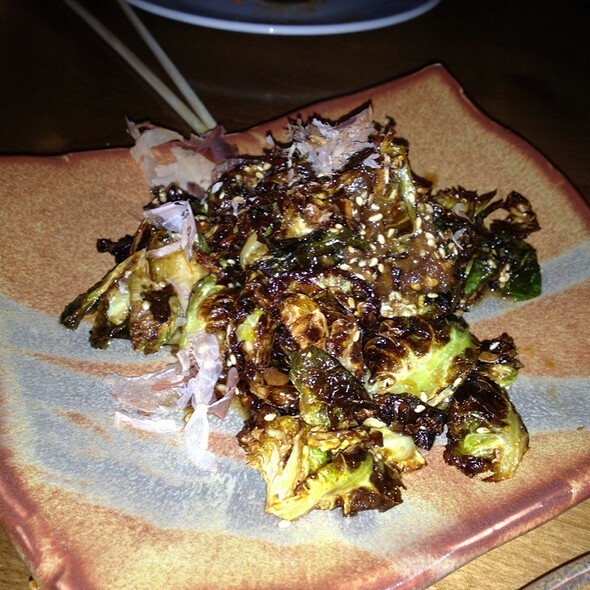 This allows you to try a larger variety of the small plates without breaking the bank. - Do leave room for dessert. Even if everything sounds amazing on the menu... the desserts are comparable if not better! - Do use valet parking... This area is difficult to park and the valet right in front of the restaurant will make your experience that much better. - Don't forget to make reservations weeks in advance... It is one of the most popular restaurants and is definitely hard to get a seat. - Try not to arrive late... The hostesses are very considerate, but walk-ins may get your table if you come too late.